Chess rules are relatively easy to learn, I would say that they are somewhere around a medium level of difficulty. What makes the game so complex and beautiful at the same time is the huge number of possible moves at any point during the game. Chess is an abstract battle board game played between two opponents. 32 pieces: 16 white pieces for one player and 16 black pieces for the other player. 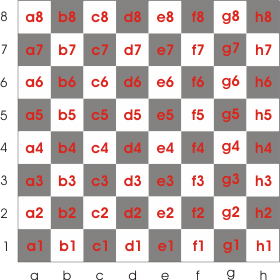 The chess board is placed in between the two opponents in such a manner that each of them has a black square on the left corner of the board. Both players start off with an identical set of 16 pieces: 8 pawns , 2 rooks , 2 knights , 2 bishops , a queen and a king . In the table below are shown the 6 types of pieces along with their names and symbols. I should point out that the name and thus the symbol of the pieces is different from one language to another. Each player must move one piece at a time. So, in fact, the game is played in a succession of moves. Each piece moves after a certain rule form one square to another and the game always starts with the player having the white pieces, making the first move. A piece can also capture an enemy piece according to certain rules. 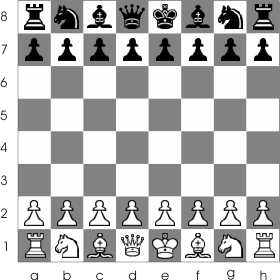 Some pieces are more important than others depending on their range of action and their value; for example: the queen is the strongest piece on the board because it has the greatest range of action while the king is the most important piece because it is the main piece targeted by the enemy attack. There are times when a move implies the movement of two pieces: when capturing, castling or promoting a pawn; for example when a player captures a piece he takes that piece outside the board and move his own piece in its place. The game revolves around attacking the other side's king. When a king is under the threat of being captured it is said that the king is in check (usually the side attacking the king announce this by saying 'check' but this is not imposed by the rules). When a king is in check it must be moved otherwise it risks being captured (many people don't know this but the king can be captured). The objective of each player is to checkmate his opponent. That means bringing the enemy king in such a position that when attacked it has no available square on which to move. When a player checkmates his opponent king he wins the game. While the game evolves both players develop their positions by making various moves and capturing various pieces. This means that the number of pieces will diminish along the game. As you will see in the following articles, because of this, the game's priorities will change along its duration. The rules will remain the same but the objectives will be slightly different. This is why the game can be divided into three different parts depending on the number and the position of the pieces: the opening, the middle game , the end game. There are times when neither of both sides can win the game. In this case the game ends at equality and it is said to be a draw(a tie). This situations are quite frequent especially when both players are around the same level of expertise. The game doesn't need to be balanced in order for the game to end a draw. This is thoroughly discussed at draw and stalemate. If the game reaches to a point where the advantage of on side is obvious or a draw is inevitable, the game could be ended if both players agree on the result of the game. If you want to better understand the chess rules you will have to study various games. In order to do that you will have to know how the games are recorded. There are more than one official ways of writing down a game. We will use in this site only one type of notation, the most common one : algebraic chess notation. The notation is quite simple. In order to realize what went where, each square has its own coordinate. Each row (called a rank) of the board has a number from 1 to 8 and each column (called a file) a letter from a to h, each of those directions starting from the left corner on the side of the white pieces. This way each square, sometimes called a field, has its own unique coordinate (made of the intersection of a line with a column) as shown in the board below. This subject is covered at notation. In the above paragraph I talked about directions (the rows 1 - 8 and the columns a to h). I should point out that beside those type of directions we also have another type : the diagonals. The diagonals are made of squares of the same color. 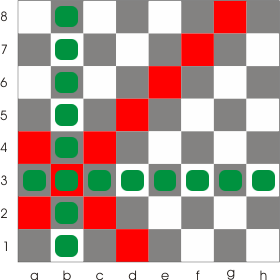 Look at the following example: through the b3 passes two diagonals d1-a4 and a2-g8 (marked in red), the rank 3 and the file b (marked in green).The diagonal a1-h8 is called the main black diagonal and h1-a8 is called the main white diagonal. Don't pressure your opponent in moving to fast. Remember: this is a game of patience! If you moved a piece you can't take back your move. If you touched a piece than you must move that piece. If you want to arrange a piece that might be a little bit outside a square than you must announce your opponent. If you moved a piece on a square and you didn't take your hand off it, you can move it on another square. If your opponent lets you, you can take back your move or move a piece different that the one you touched. This are all the chess rules you need to know for now. There are other rules concerning how the game is played in official competitions that you can find on the world chess federation site, but I suggest you learn them after you know how to play chess. And in order to know how to do that you need to know the chess rules concerning how each piece moves and captures. You can read about that by going to the next article.